Any 4G/5G network is essentially a wireless bit pipe that carries data and provides mobile IP services. To enable critical communications services that meet the needs of users, a special service layer is also needed. This Critical Communications Service Layer is implemented by the Airbus Tactilon® Suite, which combines the capabilities of TETRA/Tetrapol networks and broadband communications, including smart devices and apps. Tactilon Suite is a hybrid solution that offers mobile broadband for public safety users. One way of evolving towards broadband services is to start a Secure Mobile Virtual Network Operator service. 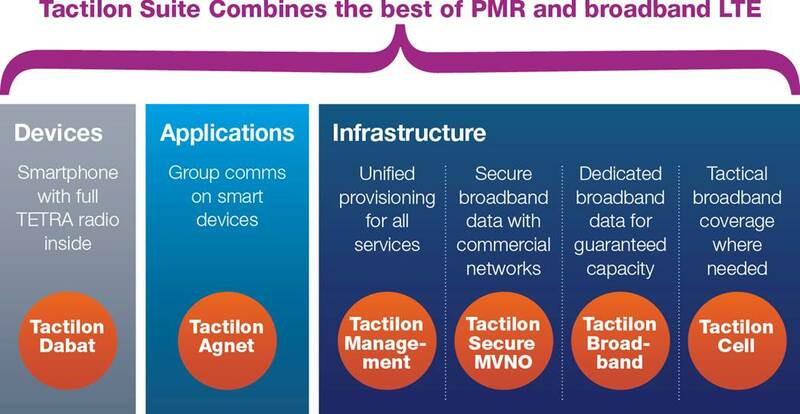 Put very simply, a Secure MVNO will use a hybrid network: enhance the PMR network with several commercial mobile operators’ services to serve its customers. You can add dedicated broadband capacity as needed to further improve the coverage, or when there is the need to make applications more mission-critical. Introduce new broadband applications and smart devices. Policeman in the field wants to share a picture or video of the situation with his colleagues. He does not care about the technology providing this to him, as long as it is reliable and secure. In some countries, authorities can use their own broadband frequencies. They can have dedicated broadband services in addition to their mission-critical TETRA/Tetrapol networks. Dedicated broadband services might be available in remote areas not covered by commercial broadband, or in urban areas where congestion is likely. The users, organization, the whole operational model created for TETRA network can be reused with the help of Tactilon Suite. Tactilon Management can manage and control the dedicated broadband users, groups and organisations as well. It provides security and service control. See how hybrid solutions open up a new world of applications to help public safety and other professional radio users work more effectively every day. Mission-critical operators need to plan for PMR evolution. This White paper explains the steps needed for success. Hybrid network investments add value today, but also offer long-term benefits by forming a bridge between existing networks and future solutions. Tactilon Suite helps operators and end-users in their evolution towards more advanced mission critical communication. Astrid, the Belgian public safety network operator has set up a Secure MVNO solution. It employs a hybrid network model for the Blue Light Mobile service that it launched for its public safety customers in 2014. More information about ASTRID network. The nationwide VIRVE public safety network based on TETRA will serve until 2030. The Finnish public safety network operator is modernizing the network. They have a strategy which will take them to mission-critical broadband. More information about VIRVE network. The Swedish public safety network operator MSB set up a Secure MVNO pilot project based on Tactilon Suite as early as in 2014. More information about RAKEL network.